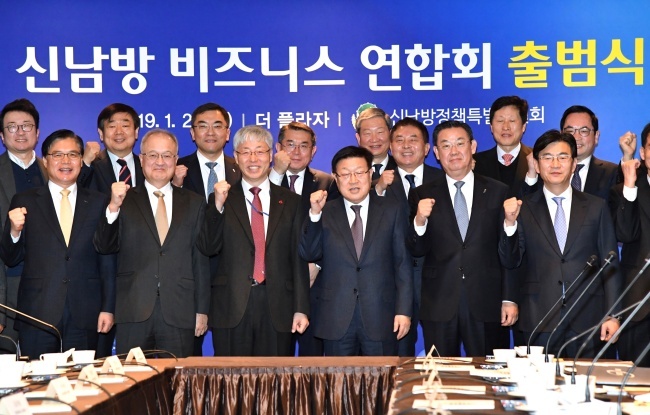 Leaders from Korea’s major business associations and the Presidential Committee on New Southern Policy gathered Thursday to form an alliance to help Korean entrepreneurs seek better opportunities in the emerging ASEAN market. The business alliance for ASEAN comprises 21 key business associations, including the Korea International Trade Association, the Korea Chamber of Commerce and Industry, the Korea Trade-Investment Promotion Agency, the Korea Federation of Banks and the International Contractors Association of Korea. Kim Young-ju, chairman and CEO of the Korea International Trade Association, was appointed the first chairman of the federation. “The new alliance will be a key communication channel between the government and nearly 8,000 Korean companies doing business in the ASEAN market. KITA will simplify the channel by combining all the resources of alliance members, and help the private sector to address business difficulties in the region,” Kim said during a press briefing. “ASEAN nations are no longer just our export markets or production bases. They are our key partners for mutual growth,” said Kim Hyun-chul, presidential adviser for economic affairs and chairman of the Presidential Committee on New Southern Policy. “This year will be the year that produces the largest output since President Moon Jae-in announced the New Southern Policy in 2017. He will visit all the ASEAN nations by this year,” he said. In the first half of the year, the alliance will hold a New Southern Policy digital economy forum with the aim of helping Korean companies to explore new business opportunities in the areas of e-commerce, mobile business and smart mobility. “The digital economy in ASEAN countries is very advanced with high-end e-commerce and social network service technologies. The forum will be a venue for Korean firms to venture into the digital area,” said KITA Chairman Kim Young-ju. ASEAN nations are becoming key to the Korean economy as it seeks to diversify its trade markets amid ongoing US-China trade conflicts, growing protectionism and rising concerns about Brexit. Last year, ASEAN markets made up the second-largest trade partners with Korea, with a 25 percent on-year rise. This year, Korea will host a Korea-ASEAN summit as well as the first Korea-Mekong summit -- a meeting of leaders of South Korea and the Mekong River countries of Laos, Cambodia, Myanmar, Vietnam and Thailand.